Stanza had the most liked content! Thanks to all the Dunfermline (and Falkirk!) fans who contributed £663 yesterday to DADSC's 1st Floor Access Fund. HMRC will eventually add 25% to that through the Gift Aid Small Donations Scheme. We also raised £82 on the merchandise stall, so we hope you think you got value for your purchases. Well done to everyone who helped, in particular bucket collectors Adam, Bob, Clover, Elaine, John B, John F, John S, Nicola, Paul, Roger, Russell, Stephen and Wullie ;our super salesmen Mike and Stuart; and our cash counters Jean and Jim.If you missed out on contributing, you can donate online at any time to the DADSC bank account at:Sort code – 80-06-55Account- 0602 8646Please mark the payment “DONATION”. Please remember to bring some spare cash with you tomorrow, to put in the DADSC buckets before the game and/or at half-time. If you would like to shake a bucket, please be at the Club Shop entrance between 1.45 and 2.15, where you will get your DADSC hi-vis vest and a bucket. You will be given instructions on where to stand to collect from supporters, and where to return the buckets. We'll also have a stall in the concourse of the Norrie McCathie stand, selling DADSC keyrings, candles, badges and other DADSC merchandise, all at knock-down prices.Every penny will go to improving the facilities at EEP for our fans with a disabilities. We're really appreciative of the generous support given by Pars fans in the last few years. Let's keep it going tomorrow. At the Falkirk match on Saturday, we are holding a bucket collection to raise funds for Dunfermline Athletic Disabled Supporters' Club (DADSC). But we need volunteers. The more collectors we have, the more money will be raised.If you can help, even for a short time, please be at the Club Shop entrance between 1.45 and 2.15, where I will issue you with a DADSC hi-vis vest and a bucket. You will be given instructions on where to stand to collect from supporters, and where to return the buckets.We would also like some people to help collect at half-time outside the catering stalls in the Norrie, North-West and Main Stands. If you are willing to do this, please let me know on the day.And even if you can't shake a bucket, please give generously on Saturday! 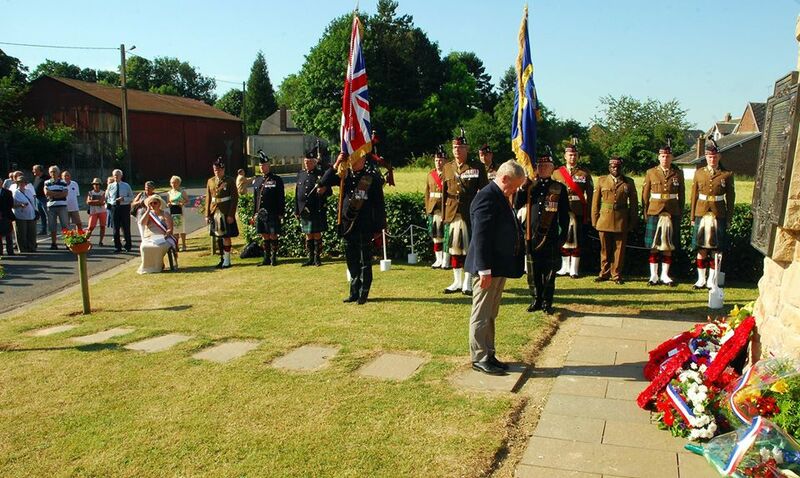 For the past few years, the Heritage Trust has represented DAFC on 1 July at Contalmaison in France, when wreaths are laid at the McCrae's Battalion Trust memorial to those died in the Battle of the Somme, including Davie Izatt and Jimmy Morton of DAFC.If you would like to represent the Trust and DAFC this year, please email enquiries@daht.org.uk by Wednesday 20 March for more details. The timing and administration of Supporters' Council meetings is now the responsibility of Drew Main as the club's Supporter Liaison Officer, and the notes of all meetings are still published on the club's official website. @Adam101 Thanks for the offer of help. If you can send me a message with your real name and contact details I'll be in touch. TBH, in between the quarterly meetings there isn't really anything the Supporters' Council does - up to now we've just had an ad hoc group of about half-a-dozen who have a pre-meeting about a month ahead to arrange the content and speakers. You're welcome to join in and pehaps come up with some new ideas. That's all that's involved - unless you are helping at the meeting or an action point emerges. It's really up to supporters how they want to see the Council develop - there are several supporters' groups who each do their own thing and there is no desire to change that, but (I think) only the Supporters' Council offers a regular opportunity to meet and challenge the Board. I think a lot of the ideas put forward in the last few weeks can be easily incorporated into the present arrangements. But if supporters want it to become something quite different from what it is, either in style or content, eg a body with more teeth, or a completely different way of holding the meeting, eg using then there have to be volunteers willing to take it on. One thing that concerns me slightly is the idea that some fans are not attending because they don't see any benefit to themselves from what they would get out of being there. That may be true, but we should be looking at it from the other direction - ie, what benefit can we bring to the club by taking an active part in setting its direction? Surely as Pars supporters we have learned the bitter lesson of what happens when there is a disconnect between the Board and the ordinary fans. Thanks for pinning this, Piracy. It would be good if anyone could chip in the occasional idea - there have been lots of good suggestions, both here and in "the other place" and we'll certainly look at all of them before arranging the next meeting. But what would be most helpful would be some new blood, who might organise things differently - we all tend to arrange things in a certain individual way, so somebody doing something completely different might be beneficial. (Maybe we should have a one-off organiser, like magazines have a celebrity editor now and then!) I'm sure Paradox is correct - many fans just want to get back to being ordinary supporters and not have to worry about the mechanics of how the club is run - I understand that, but I think it's vital to embed the Supporters' Council NOW into the way the club works. Otherwise, there is a risk that somewhere down the line, perhaps when the present BoD etc have moved on, the gaps that existed in the past between Board and Supporters may reappear. There's really no point at all in having a "supporter-owned club" if over 95% of the supporters don't want anything to do with how it's run. I'm not saying "non-traditional" ways of holding/transmitting meetings are necessarily a bad thing, and maybe that's the preferred option for a generation who often choose to watch football on TV rather than to attend in person. But anything other than a standard presentation-type meeting will need the involvement of someone with more technical knowhow than any of us currently involved in organising the meetings! But again, that's no bad thing - we won't be around for ever and it would really make sense for someone younger to take things to the next stage, if that's what people want.